Miracle is an amazing young woman…an absolute shining light in this world. Miracle is autistic and non-verbal, but don’t think for a second that she doesn’t have a million ways to communicate with you. Her smile melts your heart when she’s happy, her eyes light up a room when she’s excited, and her dancing and twirling lets you know she’s comfortable and secure. Miracle loves nature and being outside. She especially enjoys exploring outside and playing with and among the trees and plants, and she really likes flowers. She is primarily tube-fed, but she has recently begun to eat food by mouth. If you guessed that her new favorite things in the world are chicken nuggets and French fries, you’d be right! 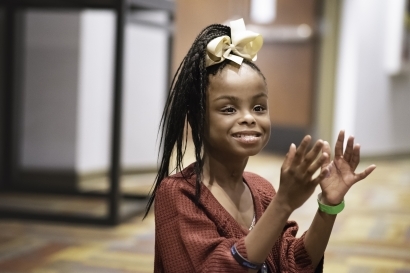 Miracle needs a two-parent home with a family experienced in raising special needs kids or who are willing to learn how to provide her with the supports and services she needs. It will be an investment of time, energy, and commitment, but the payoff with our friend Miracle will be immense! A lifetime of loving smiles, bright eyes, and carefree dances among the flowers awaits.